But what can save Blu-ray? The death of linear TV viewing has long been predicted, but if anything is ever going to kill it off, it probably won't be on-demand content. During a panel on the future of television at Samsung's European Forum, Simon Bryant from consumer electronic research firm Futuresource said that our television-watching habits haven't changed as dramatically as some TV manufacturers and industry watchers might believe. "[That] people still dump themselves in front of the TV for hours a day is typical across a lot of countries, and that really hasn't changed," he told the audience, adding that, for 75% of people, linear viewing is the main way they watch TV. "It might surprise people to know that linear TV is still very, very dominant in any market we look at," said Bryant. "We think linear TV is here to stay." Bryant added that the data skews as you move toward the younger demographic, who are more likely to enjoy on-demand media. Secondary TVs are also falling away and being replaced by tablets. What's interesting is that, while some of the talk focused on the TV becoming a more rounded "hub" of the home, Futuresource research believes that some of the features being thrown at TVs right now won't have broad appeal. "People do eBay and social networking on their smart TV, but it's the minority," he said. "It's really about video and video entertainment." 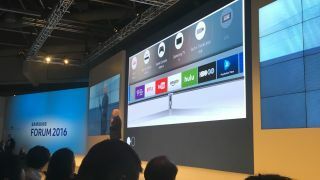 He also added that the variety in applications that people use on their smart TVs is "nowhere near as diverse as it is on a phone." "We think mobile makes a more sensible user interface for controlling the home," he said. As for the part virtual reality will play, the general consensus of the panel was that it's here to stay, although Tim Webber, visual effects supervisor on The Dark Knight and Gravity, added "the method of storytelling will have to change" in order for us to watch movies and television using VR technology. The panel also touched on the new 4K Blu-ray format. 4K Blu-ray players and discs will roll out this year, but it's fair to question whether the format will be widely adopted, or whether it will be marginalized to the dedicated cinephiles. "We think 4K Blu-ray will extend the life of Blu-ray a bit, but the numbers are falling everywhere for packaged Blu-ray DVD," said Futuresource's Simon Bryant. "We think ultimately it will extend the life of Blu-ray but not lift Blu-ray."